After the successful album and tour of The Gentle Storm in 2015-2016, there was clearly an international interest in more progressive music from Anneke van Giersbergen. She settled for the name VUUR, meaning fire, passion or drive in Dutch for her new progressive metal band, formed with top notch musicians from The Gentle Storm and her solo band. On Palladium’s stage you will see Anneke on vocals and guitar, Ed Warby (Ayreon, The Gentle Storm) on drums, Johan van Stratum (Stream of Passion, The Gentle Storm) on bass and the guitarists Jord Otto (My Propane) and Ferry Duijsens (The Gentle Storm). 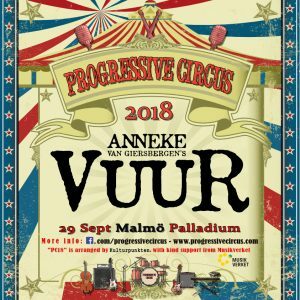 Expect thunder, heavy riffs and the wonderful voice of Anneke soaring on top as VUUR closes the festival in an epic way!